This weekend I made the annual trip to the NEC for the Warley National Model Railway Exhibition. It is by far the biggest show of its kind in the UK, which can be both good and bad, all at the same time. Good because it has an unrivalled range and number of exhibits but bad because it can be a struggle to see everything in one day! It’s usual to visit and then in the week or two afterwards to see posts online about the show and see something you cannot recall seeing or didn’t even know was there! There’s some real quality work on display (along with some tat too indicating the old boys’ network of model railway clubs is alive and well) with a really good range of traders. Just as layouts are chosen to provide a real mix so too are the traders. In the past I have been a trader at Warley and was impressed by this approach. It gives a much better experience for the visitor whereas other big shows, normally the commercial ones like the BRM show at Doncaster, where the trade has been at times dominated by the box shifters. Which is better for the hobby, I wonder? Mostyn by the Barrowmore Model Railway Group. Behind the scenes at Mostyn. The stock is just as much an appeal for many as the layout itself. The position of the layout at the show meant it was easy to view the fiddle yards and see the huge array of stock which feed the large layout with a constant stream of trains. One of my favourites in action! Philip Sutton’s 47227. Continuing with the current anniversary of the Railfreight sub-sector launch of thirty years ago, Rail Express had a really lovely display of items and stock connected with the anniversary. All the major, mainstream magazines have a significant presence at the show – the size of the hall and space available gives a chance for the magazines to have a good amount of space. This is something which does set the show apart from all the other ‘big’ shows. The Rail Express display celebrating thirty years since the Railfreight sub-sectors were launched. One of the joys of Warley is the range of layouts, layouts you might not normally seek out or go to see. And normally I’ll find there’ll be an oversees layout which can really grab you. And overseas doesn’t just mean the subject matter but in many cases it refers to where the builders are from. Often you’ll find European modellers exhibiting at the show and they bring something really different as modellers from different countries all seem to have their own take on how to produce a model railway. Van Lingen naar Gefrees is just one of those layouts which might not be a normal choice for what you might seek out – a scenic gauge 1, German layout. Or perhaps, rather, a series of linked dioramas. All to a very high standard indeed and with one of the very best and effective installations and use of DCC sound I have ever seen! The physical size of the models undoubtedly helping this but the combination of the superb weathering of the models meant everything combined to create a wonderful illusion of reality. But there was another exhibit which blurred the lines between model, art, fantasy and reality even more than any other layout I’ve ever seen. The Dutch Ijsselstein Diorama which is one of the very best examples of perspective modelling you’ll ever see! The scene is barely a foot deep but when you stand in front of it the feeling of depth is stunning. Simply stunning. Bearing in mind the show is full of model railway enthusiasts it’s perhaps funny to see how long they would stand waiting for the small tram loco and its trailer to pass through the scene while absorbing the scene as a whole. The care and skill which has gone into creating this is well beyond what one would normally see at a show – this is a beautiful example of the art of the model maker. It also sums up The Warley Show – one small, niche exhibit attracting the sort of attention normally reserved for the big name exhibition layouts. People standing five and six deep to look at a scene barely three feet across. The show can produce all sorts of gems and surprises and this alone is why we should support it. Forget the announcements from the big ready to run manufacturers, that’s simply manufactured hype aided and abetted by the likes of RMweb for marketing purposes, go to see the wonderful and diverse examples of superb modelling, mainstream, niche and beyond, which this wonderful hobby produces. As you may be aware, it’s thirty years since the Railfreight sectors were launched. Rail Express has produced a time modelling supplement to celebrate this anniversary. It’s a substantial piece too. Certainly for those interested in the period it’s well worth getting – the only problem is that Rail Express Modeller could do with a broader selection of authors, much in the way which the old ModelRAIL supplements had. That’s not to being critical of any of the content or authors in this edition whatsoever. Indeed, the articles are all very good. However, three of the articles are all too similar – all deal with very basic detailing and weather of locos in the sub-sector triple grey. All too similar really – in their own right, they are good, but I’d have liked to have seen a wider selection of articles – personally touching on how the sectors actually operated, explaining how this could be replicated in model form might have been a great use to many modellers. It’s only thirty years since, but the railway has completely changed now and the railway of 1987 is not that which we see today. Compared with the Sutton and Bayer eras, I worry that Rail Express Modeller has lost its way to a certain degree now. Go back to March 2004 where you find a very forthright and edgy piece suggesting minimum standards for ready to run releases and cracking ten step guide to improving the Heljan class 47 – I would go as far to say that it’s a higher standard than now – printed on much better and nicer paper too, the current magazine feels terribly cheap to touch. Certainly it was pushing boundaries far more that it does now. This was, of course, the magazine who have faced legal action from manufacturers for publishing honest reviews of products too! So enjoy the current issue for celebrating, what was for many of us, a golden time in rail freight but I would love to see Rail Express Modeller get some of its edge back. Earlier today, as part of my addiction to browsing railway photos on Flickr, I found this superb album of class 47 detail shots, titled Class 47 detail photos for the modeller. There are some absolutely superb detail shots which will be very useful for anyone modelling the type. Click here or on the photo to visit it. The previous posts on the rebuilding Lima class 47s have brought some very nice comments, both public and private. One request was for more details on the work on the underframes – this is something which makes a huge difference to the appearance. The first budget class 47 based on the Lima model complete with the completely rebuilt underframe. I’ve made reference to Gareth Bayer’s article in DEMU UpDate on rebuilding class 47 underframes a number of times. This article had huge impact upon me – it seemed like a revelation and it encouraged me to look beyond the obvious way of detailing models and take things a step beyond the obvious. The original article the article in ModelRAIL by Lawrence Dickinson. Gareth was in turn influenced by the article in an early ModelRAIL supplement by Lawrence Dickinson – Lawrence wrote a couple of articles round this time (the other was a superb piece on a Class 40 with Dyna-Drive) and they still stand up today. The article on modelling class 47s is still a useful read for anyone contemplating this sort of conversion. Gareth, however, took things even further with his underframes. I have shamelessly stolen Gareth’s method! I won’t reproduce just what Gareth’s article said, but these are the main stages which will show the overall process. Gareth Bayer’s article from the DEMU UPDate, No. 27, Autumn 2001. The initial stage of the the work involves removing most of the ‘box’ leaving only the battery boxes and ends of the oil tank. Lima chose a battery only type underframe, the variant without either the original water tanks or the later long range fuel tank. For the battery only variant as for 47294 and 47380 the battery boxes, their brackets, the oil tank ends and the angled pieces near the battery boxes – these latter items are associated with the brackets for securing the water tanks when fitted. I drilled out material where I could joined these up with a sharp blade. A brand new blade makes light work of cutting the plastic Lima used. Care at this stage sets things up nicely ensuring a neat appearance as thing progress, but be careful as the chassis is very fragile now and could easily break. A new ‘floor’ will begin to reinforce the chassis, 20thou Plastikard works very well – I also braced it on the upper side to make it as solid as I could. This will provide the base for all subsequent parts so, again, care at this stage is repaid handsomely later on. Adding the substantial frame which protrudes beneath the loco in the centre is what really starts to bring the loco to life I think. The UpDate article had a useful template for this but using photos as a guide you can easily estimate the size required. It really adds to character to the model and begins to fill up the gaps we’ve already created in the underframe. Although there’s a lot of ‘fresh air’ to be seen around the underframes, there are many places where you can look through the underframes, so to speak. The underframe is already beginning to take on a more three dimensional appearance, even at this early stage. 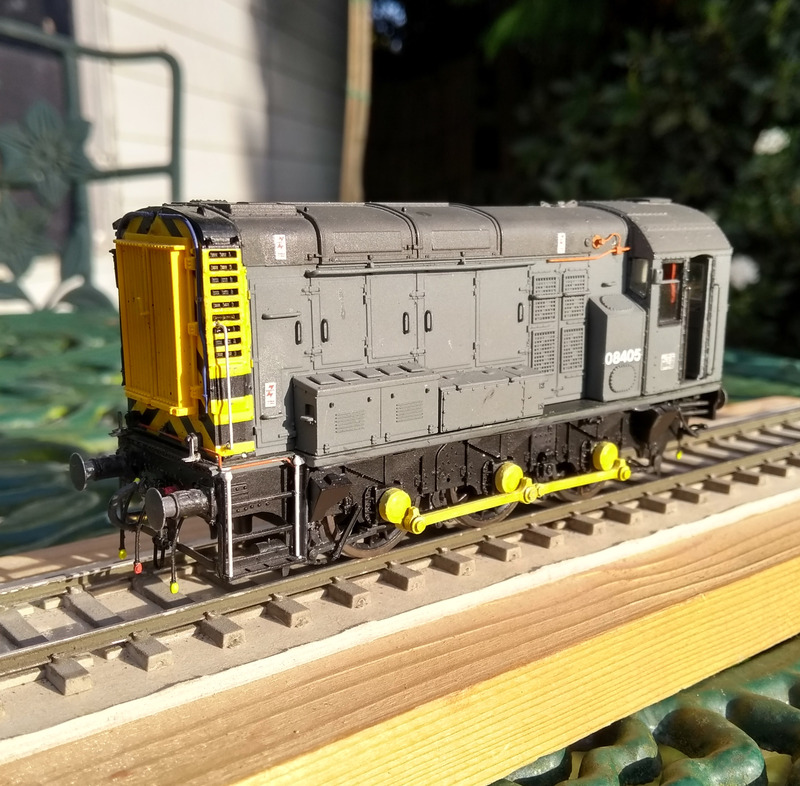 This completes the core of the underframe, from here on in, it’s a case of adding details – Gareth’s article is very helpful here. Combine this with prototype photos and it’s quite a nice, steady detailing job – quite relaxing in many ways. Brian Daniels’ album on Flickr is an excellent source of information for this. Arm yourself with various bits of Plastikard and wire you can go as far as want, adding as little or as much as you feel necessary – after all, however much you add will be better than what was originally there, but we’ve made full use of the lovely tooling eveident on the battery boxes and oil tank. The completed but unpainted underframe for 47380 – in this state the layout of parts can clearly be seen, as can the variety of material too. Very impressionistic, but in the gloom, it looks just like it should. I don’t pretend that this is a perfect result. It’s very much impressionistic modelling – adding key details, pipe runs and trying to capture the right kind of ‘feel’ for the model, this latter goal is one which can make or break a model. A model can be very dimensional accurate but if it lacks that certain something, they can be stale, sterile and just not feel right and be, ultimately, quite disappointing. What I like about the approach of Gareth and Lawrence is that they didn’t accept things as they were, not content with just a respray and a renumbering, they set about doing things in their own way. In these days of plentiful and varied ready to run models, it’s something we’d do well to remember. The previous Lima conversion feature here was a really good start I felt. However, I did feel it could be refined further. The next conversion introduces a number of new variations and modifications compared with the first of the ‘Budget Brushes‘. 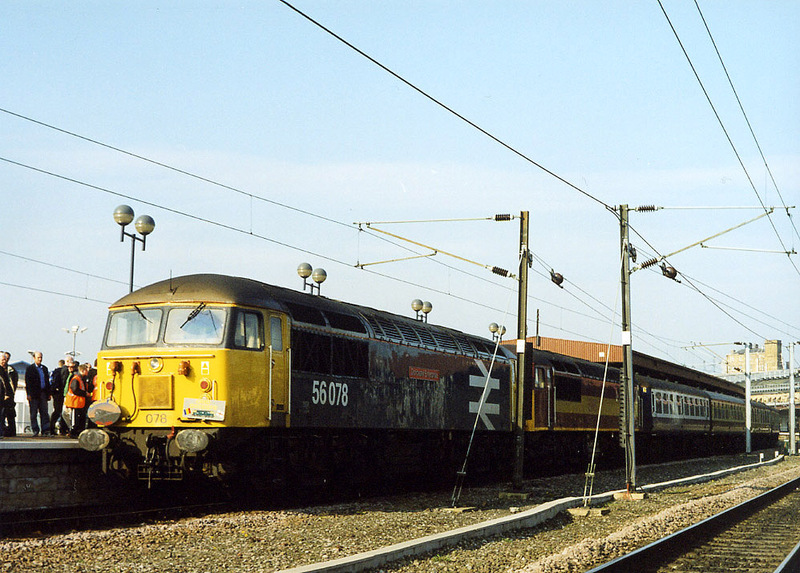 My choice of 47380 was really based on a silly reason… Well, it was an Immingham machine in the early nineties and I really liked, wait for it, the oval buffers it had! Silly I know, but they made it subtly different. These were fitted to a number of Immingham’s class 47s. There was freight traffic to Barton-upon-Humber to the now-closed Albright and Wilson chemical works until 1988 and a particularly tight curve on the approach to the works necessitated these buffers. Incidentally, there’s a very good gallery of photographs of this traffic which can be found here. Brush Type 4 Class 47 No 47380 eases through Barnetby station with a substantial Oil train bound for Lindsay Oil refinery, Lincolnshire, May 29th 1992. Photo courtesy of Lee Wise. This lovely shot of 47380 at Barnetby in 1992 by Lee Wise shows exactly what I’m aiming for – notice how faded the warning panels are. Despite carrying its home depot’s name, it never seemed to be a particularly loved machine. Immingham had a number of ‘pet’ locos which had been kept in immaculate condition (the last of the original 47/4s for example) but 47380 was never one of them. As such it never looked that well cared for externally – most views around this time back this up too, with loco looking a bit tired and sometimes very grubby! But for us, this is quite appealing. 47380 ‘Immingham’ taking shape. The scratchbuilt underframe details can be scene as well as the cutaway buffer beams. The new window surrounds can be seen plus with work around the cab. However, the more I looked and the further I got the more I realised how I’d picked one of the least standard of the type! The loco had been the subject of a number of modifications to try and make the cabs more comfortable for the crew. Most of these modifications weren’t noticeable from the outside but from my point of view the cut away buffer beams were the most obvious but the less obvious one was the additional cab roof ventilator. These came from a scrap body, part of a pair which were £3 for the two at a toy fair! The other will become 47206, but more of that another time… It is all the little things which add up on this model. 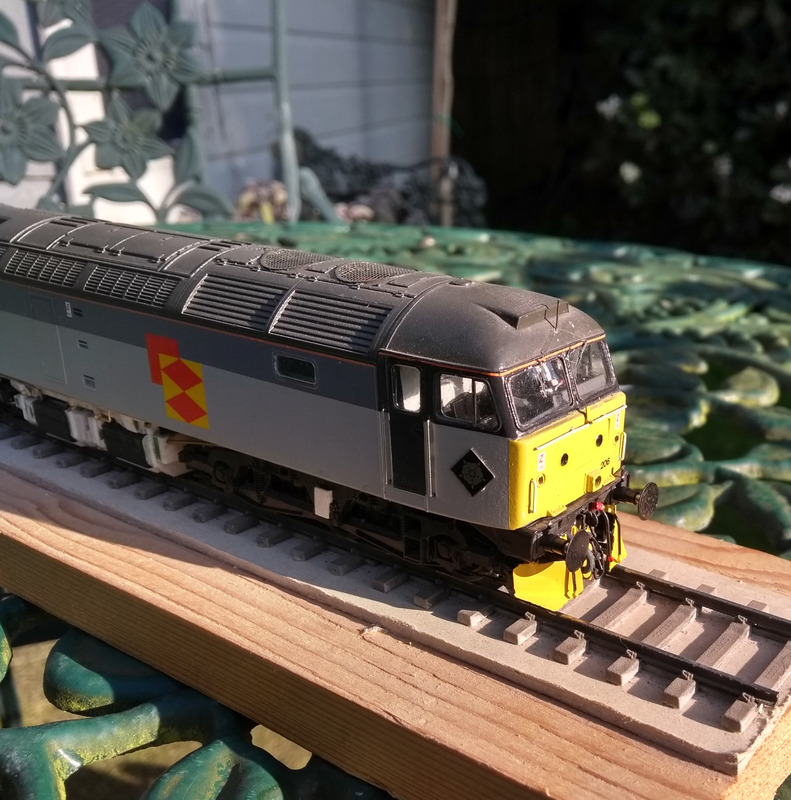 Since I had finished it, more parts had become available from Shawplan – mainly the window frames – 47294 has received the windscreen surrounds very much at the eleventh hour! Many aspects were very pleasing but as with anything, there’s always room for improvement. A good comparison of how much of a difference the replacement window frames can make. It’s quite surprising how over scale the Lima windows are. Concentrating efforts around the cabs helps I think – this is the main area where the Lima model is lacking. Carefully adding the new frames is the perfect start to this – the Lima model does have another issue in this area. The horn cowling leans back, rather than leaning forward. There is a simple way to effect this – I tried it first on 47294 but I felt the effect could be better. So this time with my model of 47380 I cut as close I dare behind the moulded louvres with a piercing saw. The isolated piece was then angled forward, gently, a little at a time and pieces of Plastikard wedged in behind it. Once it was about in the right position, the packing pieces were solvent welded in place – after they’ve set, they can be cut back and everything sanded smooth with a bit of filler to tidy it all up. Excuse the colour cast from the camera on my phone but it shows the main aspects in transforming the Lima model. The modified horn grille, new handrails all round as well as the Shawplan window frames. The other major change with this model over the original 47294 is around the buffer beam areas. As part of the modifications to reduce draughts, the buffer beam surrounds were removed which exposed the sides of the frames and locos which received this modification are noticeably different from other members of the class. This required the lower part of the cabs and moulded valances to be removed from the body. I decided that unlike 47294 where I kept the buffer beams as part of the body, that having the buffer beams completely as part of the chassis was preferable. So whilst the changes to the body were quite simple, the chassis frame had to be completely rebuilt at either end to accommodate the new buffer beams and frames. I have to admit a little ‘cheat’ by using Heljan buffer beams, for the simple reason that the draw gear is nicely moulded and it saved me having to measure and mark the buffer centres! The basic structure for the cutaway buffer beams can be seen here. Plastikard side pieces reinforce the whole structure and make for a very strong underframe. They just needed shaping at the stage to ensure the correct profile. Once the work is complete the chassis frame is, I think, stronger than the original moulding, however during the task the whole thing becomes very fragile until it’s set. The side of the moulding have to be cut away to take the new pieces. 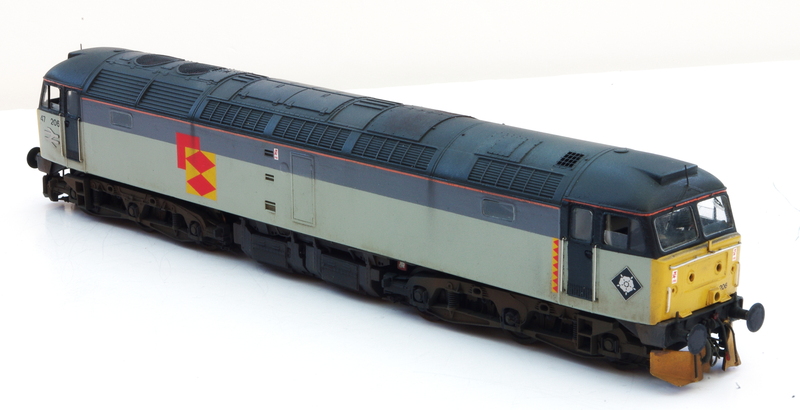 Older etched conversion kits could retain the chassis as a whole but at the cost of an accurate profile and positioning which didn’t help the overall appearance. I have no doubt this is why the Heljan model made such an impact when it was introduced as it scores so much better in this area than the Lima model. An view of the buffer beam work and also the beginning of the battery box underframe work. The underframe as a whole deserves greater attention in its description I think but the photograph above shows the beginning of the work using the ‘Bayer Method’ for detailing the underframe. This is always a really satisfying project in itself and really does transform the model – though by the end of the work, the underframe does seem to be more Plastikard than the original moulding! As you can see below, this is quite different from Lima’s ‘box’ underframe. With this project, there is still much to do – the unloved and faded appearance of the prototype will be a challenge in itself. 47380 ‘Immingham’ in primer – the undercoat has brought everything together and it’s very satisfying just how much of a difference the Shawplan window frames make to the character of the model.